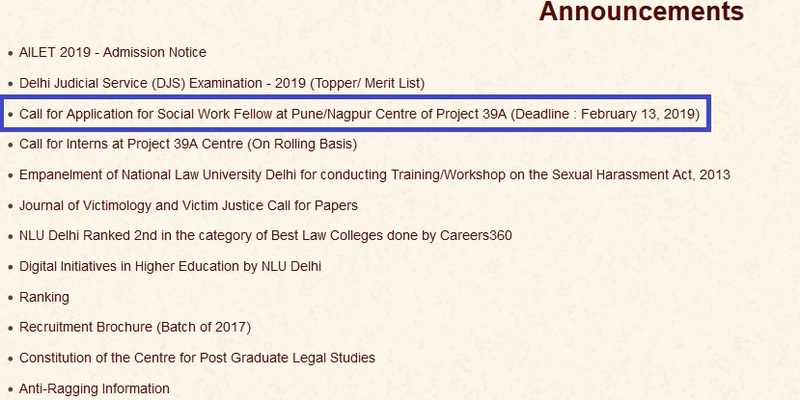 National Law University, Delhi invites applications for Fair Trial Fellowship Programme for the year 2019. The Fair Trial Fellowship (‘the Fellowship’) is an opportunity for young lawyers and social workers to work for providing quality legal representation to under trial prisoners. The Fellowship will train and mentor a group of young professionals to work in collaboration with the State Legal Services Authority towards ensuring fair trial for undertrial prisoners at both pre-trial and trial stages. Step 1 : Interested persons must send their resume and SOP in two separate documents (as attachment only either MS Word or PDF version) to p39arecruitment [AT] nludelhi.ac.in and the subject of the e-mail should be ‘Application for Fair Trial Fellowship-Social Work Fellow, [mention your location]’. Step 2 : The statement of purpose must not exceed 700 words. Step 3 : Only shortlisted candidates will be called for the selection process which may be held in Pune/Nagpur/Mumbai. Step 4 : Intimation regarding dates and venue of selection rounds will be given to the shortlisted candidates only by email. F. Identifying special needs of undertrials including pregnancy, claims for juvenility, disability, terminal illnesses, and mental health issues etc. L. Any other work that may be necessary to further the aims of the Fellowship Programme. Applications received after midnight of February 13, 2019 after which the application will not be accepted. The shortlisted candidates shall be informed via e-mail.